The signs have been pointing this way for a while, but it was still a wee bit unsettling to read the obituary of a church that Wendy & I had once pastored in. We were part of the church-planting team for the first five years, and it was a wild and woolly ride at times, believe you me. 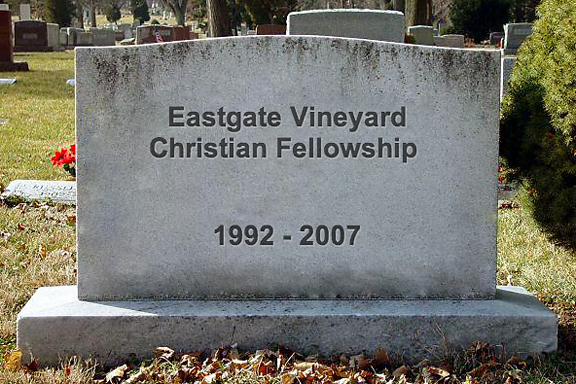 "(Eastgate) Vineyard Christian Fellowship, worshipping in and serving from several different locations since 1992, held its last service April 29 (2007). The church’s administrator announced the closing on behalf of the congregation of 50, in a letter widely distributed in May. Several pastor couples have served the church, including... Robby and Wendy McAlpine. "...The letter did not specify reasons for the closure – suggesting, rather, that 'we trust that as [God] has produced good seed in each of us... that He will plant these seeds in new places and bring growth and life through its members.'" It was also this church that eventually launched us, in 1997, into our season of Detoxing From Church. But I also remember that, unlike many churches that go through tough times, the leadership did some things right. Of special significance was their decision, on the 10th anniversary of the church, to reach out and reconcile broken relationships with several former pastors, six years after Wendy & I had left. 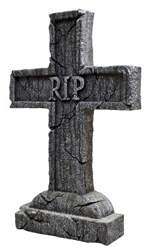 Several people have privately commented that it's for the best that the steadily-shrinking and struggling fellowship shut down, and they're probably right in saying so. But it's still a very strange feeling in my gut, when I think about a church that Wendy & I were once pastors in, and had helped get off the ground in its early years, which simply doesn't exist anymore. Maybe that's for the better, but it still feels weird.